The Pedique toenail replacement is a cosmetic improvement to damaged and unsightly toenails. It could also be described as a prosthetic nail replacement or gel nail. The specially designed gel is specifically for use on toe nails and is an acrylester (not an acrylic) bonded permanently to the exposed nail where it usually remains until it grows out. This can last from between 2 months and an average of 6 months. It usually requires some shaping and tidying over time depending on how the nail underneath grows and moves the pedique. The pedique nail is non-toxic, non-absorbent, slightly flexible (so it is less likely to crack in shoes) and shaped to fit your nail. This is in contrast to the nail wraps or acrylics that are glued or bonded to the nails in salons which can be too brittle or damage the nail. They can also allow moisture between the layers of nail causing damage. The pedique has antifungal properties so inhibits any growth. This treatment can be applied to any nail condition provided there is a nail to attach to – loosely attached or lifted nails, damaged nails and thick or fungal nails that don’t grow fully or are deformed are transformed with the pedique nail replacement. It takes 30-60 minutes to prepare the old nail and apply the pedique and it is ready for varnishing immediately. The nail is hard and set before you leave. 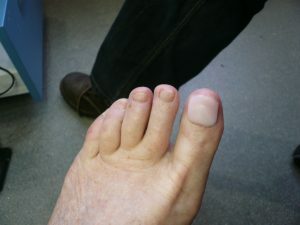 Fungal InfectedToenails: Pedique will instantaneously improve the look of the nail, and will help keep the infection at bay. It will also stop any tenderness by being a protective cover. We would usually thin and remove as much fungal debris before applying the nail. The pedique gel nail has anti-fungal properties and the treatment can be used after a series of laser treatments if needed. Traumatised Toenails: Pedique will instantaneously improve the look of nails that have been damaged by being stubbed/bruised while playing a sport, wearing tight shoes or just simply being trodden on. It will also stop any tenderness by being a protective cover. Temporary damage for example after running the marathon, tight shoes or stubbing can be rectified whilst the new nail grows underneath. The Pedique can be applied to mens nails too though they are not usually covered with varnish! The colour can be adjusted to try and match. It tends to look better than a discoloured infected nail and also seals the nail.